Fash noted that Castor & Pollux carefully selects the best organic and responsibly sourced ingredients for its ORGANIX and PRISTINE recipes, and until now these comprehensive options weren’t available for pets. “As a leader in organic and natural pet food, we’ve led the development of an organic and responsibly sourced ingredient supply chain for pets – ingredients that weren’t available in a quality, ample and consistent supply until now,” said Fash. Starting this summer, America’s #1 organic pet food brand, ORGANIX, will have a new look and improved recipes including USDA Organic certification across all recipes. This means ORGANIX is the only complete line of food for dogs and cats made with 95 percent or more certified organic ingredients. Only the good stuff, none of the bad stuff: As always, ORGANIX contains no chemical pesticides, synthetic fertilizers, artificial preservatives, flavors or colors, antibiotics and added growth hormones. Plus, organic is always non-GMO. A broader menu of organic recipes: ORGANIX kibble recipes for dogs and cats include grain-free or with-grain options; life-stage options for puppies and senior dogs; and options like small breed recipes and a healthy weight recipe. And, we’re introducing a new lineup of wet recipes in trays specifically for small breed dogs, ORGANIX Tiny Feasts. Nutrient-rich superfood blends: All ORGANIX recipes now feature superfood blends from ingredients like organic coconut oil, organic blueberries, organic cranberries and organic flaxseed. And, the new PRISTINE lineup offers a full line of recipes for both dogs and cats, made with ingredients that are responsibly raised, caught or grown to make better food for pet’s health. The #1 ingredient in PRISTINE meat and poultry recipes comes from animals that are responsibly raised with access to fresh air, natural light and space to roam like free-range chicken and turkey and grass-fed lamb and beef. PRISTINE seafood recipes use responsibly caught fish, like wild-caught salmon, tuna and whitefish. Several seafood recipes are MSC certified for using sustainable fish. Produce is responsibly grown without synthetic fertilizers or chemical pesticides, on farms that care for the earth. And, recipes are made with no artificial preservatives, flavors or colors. Grain-free recipes have no corn, soy, wheat or gluten ingredients. Cooked with love in a USA kitchen. PRISTINE kibble recipes for dogs feature responsibly sourced protein variety, like wild-caught salmon, grass-fed beef or lamb, and free-range chicken. Kibble recipes are both grain-free and potato-free. Three grain-free hearty stew recipes from PRISTINE are made with responsibly sourced proteins and produce. Plus, PRISTINE recipes in alternate formats are available for dogs, such as kibble + freeze-dried raw bites in either free-range chicken or grass-fed beef. PRISTINE freeze-dried raw meal/mixers offer complete & balanced nutrition from freeze-dried raw and can be served on its own as a meal or topped on kibble as a mixer. For cats, both dry and wet options are available from PRISTINE – potato-free kibble recipes in wild-caught salmon, free-range chicken & turkey or wild-caught tuna & whitefish, as well as wet options to provide much-needed moisture to a cat’s diet: four pate recipes in cans and four morsels in gravy recipes in pouches. 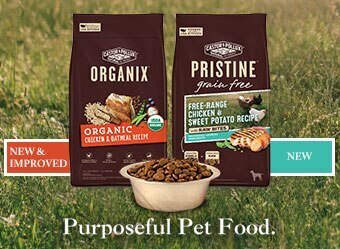 For pet parents currently feeding Castor & Pollux ORGANIX recipes, visit our transition guide at www.purposefulpetfood.com. About Castor & Pollux Founded in 2000, Castor & Pollux is a leader in organic and natural pet food. ORGANIX was the first certified organic dog and cat food to meet all of the requirements established by the USDA’s National Organic Program. Other brands include Natural Ultramix natural dog food and Good Buddy dog cookies and treats. In April 2012, Castor & Pollux was acquired by Merrick Pet Care, Inc., based in Amarillo, Texas. Our brands are available at PetSmart, Petco, natural grocery, and online via select retailers. For more information, visit www.purposefulpetfood.com.